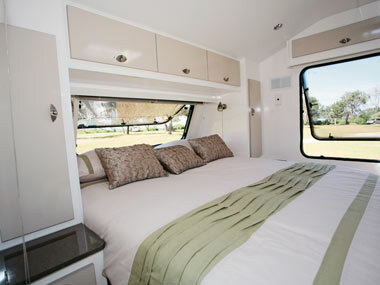 LOTUS CARAVANS IS certainly not the largest caravan manufacturer in Australia. 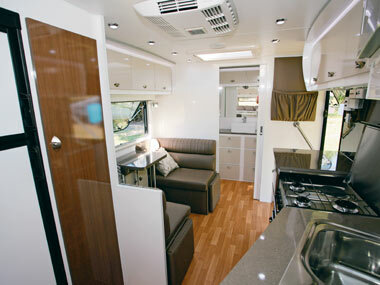 But, like many manufacturers of its size, it is able to offer a rather unique range of caravans that is constantly evolving. Stepping in through the rear entry door reveals a full-width bathroom to the right, a kitchen bench to the left with a dinette opposite, and an island bed at the front. In keeping with many a van design, a generous amount of LED downlights, along with reading lights for the bed and dinette, keep everything well lit. Two large marine-style hatches supply extra light as well as ventilation. All the windows come with integrated blinds and screens, and all except the kitchen windows have slimline venetian blinds fitted. Extra cooling is provided by the roof-mounted Aircommand Ibis air-conditioner. Undoubtedly one of the more striking features of this Freelander is the interior colour scheme. In some areas, like the bedroom, the colours are quite muted while others, like the kitchen/dinette, contain a fair degree of contrast. Nothing is particularly harsh on the eye. There's also a reasonable amount of living space, including around the bed. In the bedroom, a trademark Lotus feature is hard to miss: tall windows on either side of the bed are quite distinctive and enable a conversation to be carried outside if desired. The posture-slatted bedbase supports a 1.88x1.55m (6ft 2in x 5ft 1in) innerspring mattress. In addition to all the usual bedhead storage are small lockers above the windows. High enough to avoid head contact, these are in some ways better than the diagonal cupboards sometimes squeezed in at the foot of the bed. It might not seem much, but one of the features that works in this layout is the kitchen bench that angles out at one end. This gives a tad more benchspace and certainly more kitchen storage, as well as removing that rectangular bench look. 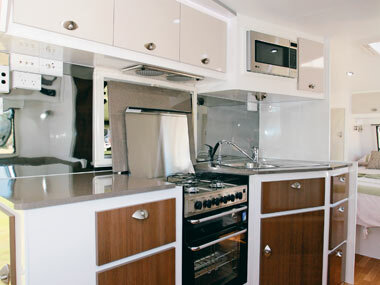 A full stove is supplied including cooktop, grill and oven, along with a stainless steel sink and drainer. The cooktop comes with a flush lid to improve benchtop space. Kitchen storage is comprised of four drawers with metal cases, two cupboards, a floor locker and four overhead lockers. The fifth overhead locker, above the sink, is occupied by a microwave. The splash panel near the entry door also looks like a bit of a switch panel, bearing light switches, the main 12V control switch and connections for the TV and entertainment system. Behind the wall lining, the frame has been strengthened for a TV mounting bracket. A Dometic 186L fridge sits between the dinette and bedroom, mounted off the floor for easy access. The Suburban gas water heater sits underneath. Alongside the fridge is a good-size, multi-shelved pantry - overstocking might be the only problem. 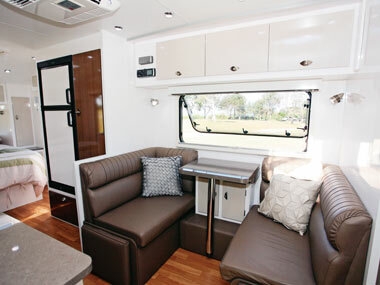 Upholstered in Italian leather, a Caravan World special, the dinette has all the goodies - contoured backs and wall cushions, a tri-fold table and hinged footrests for both seats. 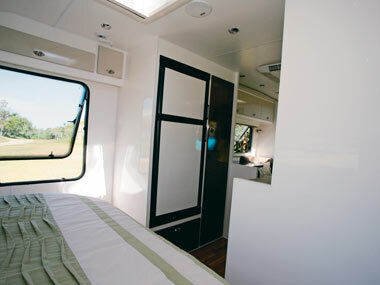 Three overhead lockers, a large window and a Fusion sound system, complete with a separate iPod holder, finish off the picture. 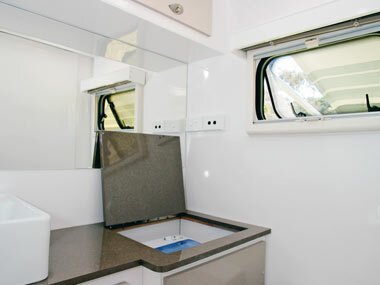 The bathroom is well fitted out with a shower cubicle, Dometic cassette toilet, contemporary-looking washbasin and Lemair top-loading washing machine. That still leaves space for a good selection of cupboards and overhead lockers, and a decent-sized wall mirror. Two exhaust fan vents and a nearside window supply the necessary ventilation. Having been designed for rough-road travel, the Freelander rides on tandem-axle load-sharing Simplicity suspension with a leaf-spring/trailing-arm setup. 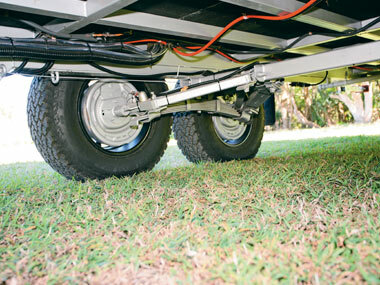 The suspension is bolted and welded to a 100mm chassis with 4in rails, the drawbar rails running back to the forward suspension mounts. A look under the chassis reveals all the plumbing and cabling neatly strapped out of the way. 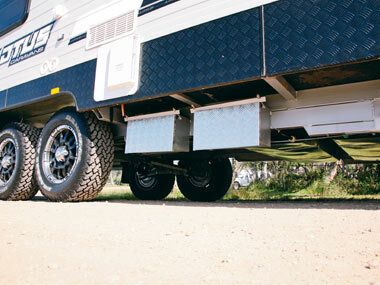 There are two sheet-protected 95L water tanks between the chassis rails towards the front of the van. 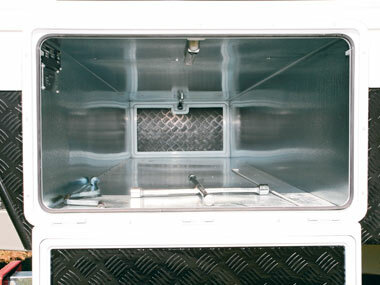 Up front, the drawbar rails support two 9kg gas cylinders with wire mesh between the rails. At the rear, the bumper is a busy place with spare wheel, jerry can holder and generator box/toolbox. Another trademark feature of a Lotus van is the external body colour, which certainly got the attention of my neighbour. The upper part is light-coloured aluminium cladding, while the lower waistline is black powder-coated checkerplate. Rather than a front boot, a decent-sized tunnel boot is accessible from both sides. Ready for the outback, the Lotus Freelander comes with a 100Ah battery, 120W solar panel, 12V outlets and an Anderson plug connection. I took the Lotus Freelander to the Noosa North Shore Beach Campground, which is a very pleasant and basic place to camp. The Freelander was ideal for that experience, being self-contained in terms of electrics. The gas fridge meant that civilisation could be kept at bay for a few days, as long as I could sacrifice air-conditioning and a microwave. Although I didn't try any sand driving, the Freelander proved more than capable on some of the rough roads I did traverse, and should certainly be ideal for some around-Australia adventures. 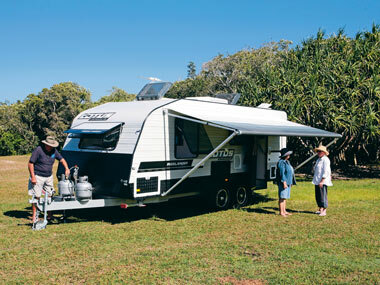 Source: Caravan World Jul 2012.